Once you have found this little gem, you can do nothing but relax. The flat is well equipped with everything you could possibly want in the kitchen. The only criticism is that there was no hair dryer or full length mirror. The village of St Mawes is a pleasant 15 minute stroll along the coast road. Whilst there are limited facilities in the village; co-op, couple of pubs and gift shops, most needs are met. A quick 20 munites ferry ride across to Falmouth is a must. This is certainly a very pleasant base to explore the surrounding countryside and coastal villages. Hope to return. Pelyn provides a great base for St Mawes. We had everything we needed and really enjoyed our stay. Breakfast on the balcony, overlooking the boats in the yard and the wide river views was a particular joy. The bustle of the boatyard was no problem and there was no one around outside of the working day anyway. Walk to the village centre is very pleasant, either along the road around the waterfront, or over the more direct paths over the top of the village. Lovely base to explore the area, including the Roseland Peninsula, or taking the ferries from St Mawes Harbour. Looking for an opportunity of seeking a 'top-up' of sea air before winter sets in we considered ourselves fortunate in finding Pelyn available at very short notice. With my wife being a devotee of all things nautical, finding herself up and close with the activities of a working boat yard was ideal! A recurring comment in the visitors book was the level of cleanliness apparent upon our arrival. Happily, just prior to our departure, I was able to congratulate the lady responsible in person. A very minor irritation that should perhaps be mentioned was the fact that the heat level figures on the control dials of the oven have virtually worn away, leaving occupants with something of a guessing game when using it for the time.! Also, in an otherwise almost pristine presentation of the apartment, the rusty door stop in the WC/Shower Room would appear to be a minor problem that could easily be remedied. All good at the apartment. The only comment I would like to make is that the metal poles (maybe props for the boats or scaffolding?) were placed right up against the wall outside the patio doors. Appreciate that it is a working boatyard but if they could be relocated away from such a superb view I'm sure other visitors would enjoy the uncluttered view and their stay even more. Reply from Mark Thank you for your suggestion Phil. Unfortunately due to space and of course, as you mentioned a working boatyard, we are limited to where we can place items/boats within the yard. This time of year is especially difficult due to the volume of boats that have to be launched and retrieved on a daily basis. Also from the end of this month the yard will start to fill up with the larger boats coming in for their winter storage. We are pleased you enjoyed your stay and will keep your suggestion in mind. We are always happy to have suggestions and where possible we try to implement change. Hope to see you again. Very comfortable accommodation for 2 people. Loved the location overlooking a working boatyard and estuary - idyllic views. Only 10 minute walk into St Mawes for pubs and places to eat. Very handy for footpaths to explore the Roseland peninusla. Pelyn is a lovely property, spacious, light, and. very comfortable. The view across the water is beautiful and watching the boats coming and going is very relaxing. Reply from Mark Humphrey It was a pleasure to meet you and pleased that you enjoyed your stay. Pity we were not able to supply the sunshine though. We hope you can visit again in the future. It would have been nice if loo paper and washing up liquid was provided and the heating turned on. Otherwise a very comfortable stay and well organised. Reply from Mark Thank you for your review. Pleased you enjoyed your stay and apologise for lack of toilet paper. Not sure why that had been missed and will try to ensure it does not happen again. We appreciate all feedback as this helps us to improve the facilities we can offer. Hope to see you in the future. The apartment had everything we needed, was spacious comfortable and clean, the bed was wonderful, it was great to have a parking space and the location quiet and peaceful and not too far a walk from St. Mawes - thank you. Reply from Mark Thank you for your review. So pleased you enjoyed your stay and hope to see you in the future. We thoroughly enjoyed our stay in Pelyn and have already booked for next year. To have the use of a telephone for emergency use only would be very useful. Reply from Mark Thank you for your review. Look forward to seeing you next year. Regarding the emergency telephone, due to lack of mobile signal in St Mawes we realise it can be inconvenient. We do like people to know that in an emergency, the office is manned Monday - Friday and people are welcome to pop in and use the phone if there is an emergency. Unfortunately we realise this does not help in the evenings or weekends, but we are doing trying to improve the WIFI signal to aid with this problem. Hopefully you will notice a difference with the signal when you come again. Look forward to seeing you. We really appreciated the spaciousness of the apartment and the bed was incredibly comfortable - the balcony was great, too, to sit and watch the comings and goings on the boatyard. It was very peaceful and lovely - with a great walk into St Mawes. It was also well equipped - although the sofa seemed a little old - a colander and hairdryer would make a useful addition! However, the cleanliness of the property was not really of the highest standard and I had to clean some of it myself (the booking did say to speak to the owners if there was a problem but I didn't want to cause any issues and bad feeling at the time as we were living in very close proximity to the boatyard itself). Very good value for money though as we had a late booking discount. Fabulous location! Very nice flat, very comfortable and well equipt . As I was on my own, I did feel a little isolated, having no phone signal, it would have been very nice to have had access to wifi to have enabled me contact with family via WhatsApp. Reply from Mark We are pleased you enjoyed your stay. Unfortunately we do have problems with internet/mobile phone signal in St Mawes, but hope to remedy this in the near future. Accommodation good standard in a unique location, 10 minute walk to centre. Beautiful view from apartment and very quiet. No wifi but local pubs provided free access. Accommodation well equipped but hairdryer would have been a useful addition. Parking spot very convenient - close to property. Very comfortable and a very enjoyable holiday, visited a number of places within a 40 mile radius. Not the easiest place to find but once found it was fine. On a boatyard so not a super great view but this was always clear in the seller's description, so it was as we had expected and the boatyard wasn't a disturbance. As a place to eat and sleep this was absolutely fine and good value overall. The flat was well equipped and comfortable, the only thing I'd add would be a pair of tongs in the kitchen. It wasn't an issue for us, quite the contrary, but there seems to be no mobile signal in the area (certainly not EE) and the flat has no internet connectivity. St Mawes is very pretty and a short coastal walk or 5 minute drive away, and has a number of options for food at drink to suit all budgets, as well as a small supermarket, so you can be as self contained as you wish when you elect to stay at Pelyn. Reply from Mark So pleased you enjoyed your stay. Unfortunately St Mawes is renowned for lack of good mobile signal but we are looking into trying to come up with some form of remedy regarding internet etc. Thank you for your comments and we will endeavour to improve the facilities. Hope to see you again in the future. I have scored highly for this property as it really did enable us to have a comfortable,relaxing and interesting holiday.I marked cleanliness as good only because the pan for the grill was not very clean. We have been staying in St Mawes and the Roseland for almost 50 years and this location gave a new slant to the area with its daily boat yard activity and delightful walks. Boats in front of the apartment were not a problem.The view was not impaired and they added to the interest. We will certainly tell our friends about this gem and hope to return fairly soon Many thanks Sue and Chris Pegg Derby. Reply from Mark Thank you for your review. We will look into why the grill pan was not up to standard and appreciate your comments. So pleased you enjoyed the location and hope to see you in the future. Reply from Mark Many thanks for your review. Glad you enjoyed your stay and hope to see you in the future. Reply from Mark We are pleased that you have enjoyed your stay. Thank you for the positive feedback and we hope to see you again in the future. Reply from Mark We are so pleased that you enjoyed your stay. So sorry that the ice cream was left in the freezer. Next time we will have to treat you to a fresh double ice cream to make up for it... Hope to see you again in the near future. Superb position for our holiday during the sunniest week of the year. The property is in need of some updating and the cleaner needs to do a better job. Reply from Mark Thank you for your review. Appreciated you coming into the office, pleasure meeting you. The property will be having a refresh and some additional comforts for the new season, so hope to see you again next year. Excellent base for your holiday, clean and tidy and good value for money. Quiet location and beautiful views. Walks on doorstep. Had a great time would recommend. Reply from Mark Thank you for your comments, hope to see you next year. The Pelyn apartment is a great little escape right on the water - very peaceful and relaxing! We really didn't want to leave! It felt very homely, the apartment was very clean and we settled right in. St Mawes itself is a beautiful little fishing town, everyone is so friendly! A great little escape to refresh and revive from the grind of everyday life. Reply from Mark Pleased you enjoyed your stay. Thank you and hope to see you in the new season. We stayed in the property 5 years ago, and decided to come back again this year. It's looking a bit 'tired' now, and could do with a bit of a make-over. Also the fridge needs replacing as it was hopeless. Reply from Mark Thank you for your review. We have pleasure in confirming that we have replaced the fridge and also refreshed both the flats. There are also a couple of additional comforts added to make everyone's stay more of a home from home stay. Hope we see you in the near future. Reply from Mark Thank you for your views. We will be refreshing the flats ready for the new season. Regarding the boats obstructing the view, as it is a working boat yard, we cannot guarantee that at some point in anyone's stay there will not be boats in the yard, however we do try to keep the views of the river clear when possible for the guests and hope that guests find it interesting to see the activity in the boat yard. There is certainly never a dull moment. We stayed in Pelyn for a long weekend. The location was quite quirky but interesting, with boats sitting right outside our living room window awaiting maintenance or repair. We stayed Friday until Tuesday morning. During this time we didn't get any disturbance from the boat yard. The apartment is 10 minutes walk from town, as long as you work out where the footpath is and don't take the much longer route along the road. The living room is light and airy, and the two sofas were particularly comfortable (compared to other places we've stayed in over the years). I'm not sure if the fridge was working properly, as it didn't seem that cold; but we managed ok. Unfortunately there was no sign of the DVD player (which is included in the advert) and the TV screen is pretty small for the size of the room (it's like a portable TV). The bed was fantastic! It's the most comfortable bed we've slept in whilst on holiday..... which can really make or break your holiday. We'd certainly return to Pelyn if we come back to the area. Reply from Mark Thank you, we are pleased you enjoyed your stay and hope to see you next season. Pelyn is modern, well equipped and very good value. It's location on a working boat yard provided an ever changing scene and lots of interest. Very peaceful in the evenings with just the sounds if the river lapping against the pontoon and the occasional breeze ringing around the masts if the yachts. Stunning region of Cornwall with so much to explore. Loved St Mawes, and The little church at St. Just in Roseland. Beautiful walks everywhere and lovely beaches. We would certainly consider staying here again, and enjoyed the area greatly. we caught the small ferry across to Falmouth, wnich was very convenient. We have stayed at both Polmoro and Pelyn a number of times, as the setting is ideal and the accommodation always good value. Having said that, we have a small number of gripes regarding our recent visit to Pelyn: the refrigerator may well be on its last legs, failing to keep food fresh for more than a day or two; for a summer stay, the douvet is far too heavy; flushing the toilet results in a tremendous squelching noise and, finally, it's a challenge to control the electric shower's water temperature. Our understanding is that the shower is due for replacement in the foreseeable future. However, I would always recommend a stay at either Pelyn (my personal preference) or Polmoro and, for those who have not yet visited, St Mawes. 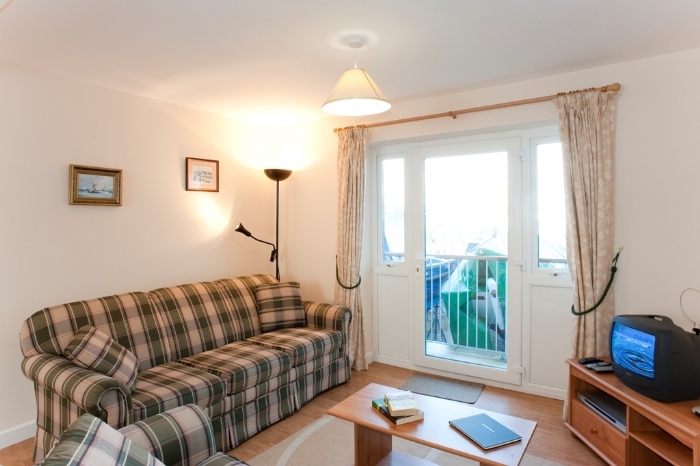 Fantastic place for 2 to stay, very comfortable, easy walking distance to St Mawes. Would love to come back in the near future. We were able to do all we wanted to do. Have recommended Pelyn already to family and friends. I had a lovely holiday at Pelyn.Pretty views, lovely walks, comfortable accomodation and easy access to the harbour. I had some difficulty finding it without sat nav. We really enjoyed our stay at Pelyn and St Mawes. We found the accommodation very comfortable and we really liked the views, the owners and location. Though a working boatyard, it is an incredibly peaceful place particularly in the evenings. We will hopefully visit again and would not hesitate in recommending it to anyone. Just returned from a great week in St Mawes. Pelyn was really lovely and we would recomend it to anyone. It was spotless when we arrived and had everything we needed. The new owner had only just taken over when we arrived but he could not have been more helpful. We had a wonderful time at Pelyn and have fallen in love with the Roseland and will be returning. 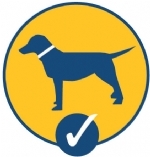 We wanted to say thank you for the information pack which was so helpful for the first time visitor and is by far the best I have been provided with by any holiday company. 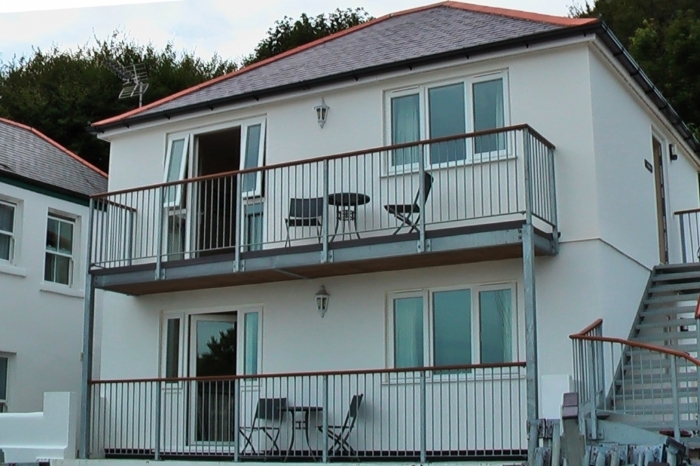 Pelyn is a modern self contained apartment located overlooking the Percuil River at Freshwater Boatyard in St Mawes. Please note that this is a working boatyard and from October to May your views outside and the light into the property are very restricted by boats being stored on the quay. However, from May through to October, depending on the weather, the boats disappear onto the water and the view out onto the River can be really appreciated. Pelyn is perfect for a couple seeking a great value base in St Mawes. Pelyn can also used in conjunction with Polmaro, our other property at this location, to provide great value accommodation for up to four people wanting to stay in St Mawes. Ground Floor Only: The double bedroom has views over the Percuil River (although please note that from October to May this view is obscured by boats being stored on the quay). The WC & Shower room is to one side of the hallway. 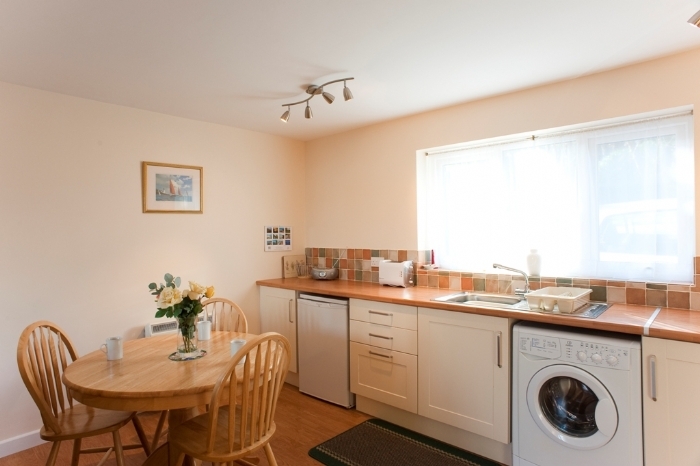 The main kitchen/lounge area is spacious for a 1 bedroom property with breakfast table, electric hob & cooker, microwave, fridge freezer and a washer dryer machine. There are 2 sofas in the lounge area. There is a fully glazed door from the lounge onto the small balcony. Inclusive electricity & heating (night storage and electric heaters). Duvets, linen & towels are provided. There is a small outside table and chairs on the balcony. Moorings, boat storage and boat hire can be arranged. TV & DVD player. Parking for 1 car. Regrettably smoking is not permitted. There are local shops, pubs & restaurants approximately 10 minute walk away around St Mawes Harbour. Other pubs are available in Portscatho (about 10 mins drive), Philleigh (about 10 mins), Ruan Lanihorne (20 mins) or Veryan (15 mins). It is important to note that the property is located on a working boatyard and there might be the odd bit of noise from work being undertaken on boats. There is a reasonable amount of activity in front of the property. From October to May boats are stored on the hardstanding and right in front of the property which does affect both the light and the views across the river.